Prices are up everywhere but most items, like food and gasoline offer us little control. It's always great to find prices you CAN control. As it turns out, you can save over a grand a year just by curbing bar time in favor of "home bar" time. Simple as that! When you're on a budget, cocktails served at the local bar and grill become a luxury. Compare those prices with same brand store selections served at home. The difference is both literally and figuratively staggering. Remember $1.00 beers? If so you're a geezer like me. 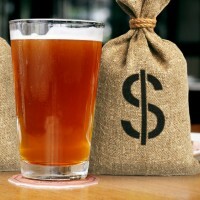 Only a few pubs still have $1 beer mug offers anymore. A Home Bar can instantly fix these problems by reducing your cost per serving to less than a dollar. In 2016, the average cost of a 12 serving of domestic beer when bought by the case, should be around 75 cents. The bar gets $3.50 or more theses days. Here's a visual beer markup calculator so you can see the considerable mark up you're paying for the atmosphere and aroma of your friendly corner bar. I think you'll quickly get the point. Party at Home! Give it a a few seconds extra to load or hit refresh. Usage: It's very easy to use, just type in the price you pay for a case of beer. That will give you the Price Per Serving. Now, to ruffle your feathers, enter in the price PER SERVING you pay at the local bar or pub. That will show you how badly they mark up the cost of beer. How about the cost of beer served at your favorite sports team stadium or your favorite band's concert arena? $8 to $12 per beer? Your best deal is obvious, save the ticket money, fire up the 70" HDTV and bring a case of your favorite suds (and pizza, sub, snacks for still less money) to the cozy atmosphere of your own home bar. Not only is the view of the game better, it also makes wise fiscal sense. No driving, safe from crazies and so much cheaper and comfortable. Plus the fridge and bathroom is within easy reach... and no confusing signs. What could be better? Have fun with the beer calculator. We are designing some new calculators to help you decide on how to serve the proper amount of beer at a party and so on.